The IDF Machbet is an Israeli modification to the US M163 Vulcan and as well as typical IDF stowage and exhaust modifications also includes a four Stinger missile pod added to the right of the 20mm Vulcan turret plus additional TV and FLIR target auto-tracking capability. The conversion is designed for the Academy M163A1 (Kit #1360) and could also be used with the Italeri M163A1 (kit #269) but the Academy kit will offer a better starting point. 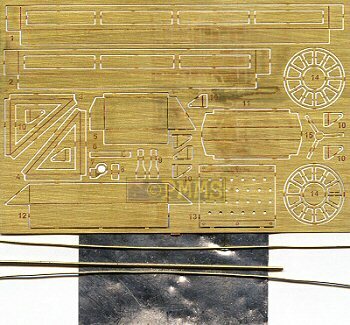 The conversion consists of 74 parts in light cream resin plus a sizable etched fret and three lengths of brass wire and a small lead sheet with of course the full colour instruction sheet. Resin quality is excellent with just the usual casting blocks to be removed before use which shouldn’t pose any problems with all parts otherwise blemish free. The hull parts include the typical IDF exhaust pipe extension with etched guard and two large storage boxes on the rear hull while the side storage racks are also in etched metal and a couple of Jerry cans. On the right rear is a reel fitting with resin and etched parts plus there are 11 resin sandbags groupings to add to the hull sides and top for additional vehicle protection and the lead sheet is used to make the securing straps to hold some of these in place while the remainder of the parts are for the turret. There is a couple of alterations needed to the Academy kit gun supports as shown in the instructions which are quite quick and easy to perform with the main parts being the new mounting for the large missile box support and multi-part stinger missile box plus the TV and FLIR sight which has additional etched parts. Other details are added to the turret such as new rear stowage rack plus upper railing made from the wire provided. The instructions are typical Legend in full colour with photos of the model during and after assembly with all the parts called out by number for easy identification and there shouldn’t be any problems during assembly as it is all quite straightforward. 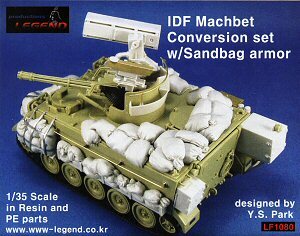 A fairly easy conversion with well detailed parts to build another typically distinctive IDF conversion with most parts simply replacing or added to the Academy kit parts and the conversion should be welcomed by IDF fans.